Getting upside down when doing yoga inversions gives me new insights when I am right side up. 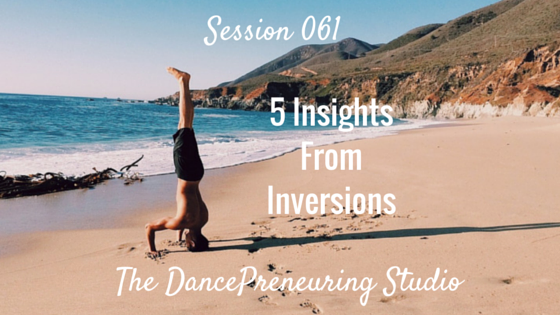 In this session of The DancePreneuring Studio, I share 5 insights applicable to life and business from inversions. What value are you bringing? Dancer’s Dialect: What do coffee and helicopters have to do with each other? Not much but they are related to dance. How? They have to do with breakdancing. Today’s step in the dancer’s dialect is a move called the coffee grinder or the helicopter and you are sweeping one leg over the other. Freestyle Flow: I was with a group of people who had made it past the initial audition process for a popular talent show, and even after their hour long interviews, they were still talking..about themselves and who they knew and who they worked with. I am all about associating yourself with successful people that you admire, however, when you are monopolizing conversations with name dropping and every sentence begins with the word “I” then clearly it’s all about you. 1. Be intentional tramadol no prescription about how you start something. The importance of the power of visualization. From an article in Success Magazine: Studies of the psychology of peak performance have found that most great athletes, surgeons, engineers and artists use affirmations and visualizations either consciously or subconsciously to enhance and focus their skills. Nelson Mandela has written extensively on how visualization helped him maintain a positive attitude while being imprisoned for 27 years. “I thought continually of the day when I would walk free. I fantasized about what I would like to do,” he wrote in his autobiography. Visualization works well to improve attitude. 2.Use fear as a compass and direction. Don’t be fearless, but have understanding. 3.There are steps and sequences to everything so even if you think you know, it’s always good to review where to start and where to end. 4. Think of something unique to reward your clients. In this inversion workshop, I was very happy to have essential oils sprayed on me and candles all around the room as we were winding down. Some of the yoga studios I go to reward their clients through points accrued through Perkville. 5. Be that reassuring person and find supportive environments to help you thrive. Question: I’d love to hear about an experience that started well and ended well.